I thought, I went, I saw, I made. I noticed the Turning Earth studio for potters when I was exhibiting at the Geffrye Museum in Hoxton last year, but yesterday I went to a talk in their larger studio in Leyton and saw their wonderful premises there. It’s in a no-nonsense industrial estate and although the surroundings aren’t pretty, it provides facilities on a grand scale in an old factory for beginners and aspiring professionals. It has been decorated to a high standard and is well equipped. This is a wonderful resource and it’s part of the current of ceramics education running against the current of closures in universities. 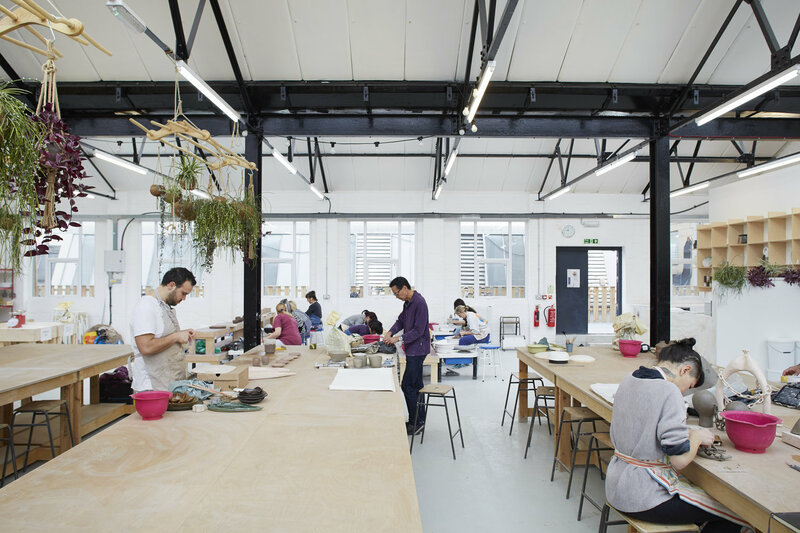 Once there were dozens of BA ceramics courses, now there is a only a handful. (I saw the closure of Harrow, the long-established course at the University of Westminster.) But the demand for training is growing, encouraged by BBC TV’s Great Pottery Throwdown, and starter classes are booked for months, even years ahead. Clay College Stoke was set up by a few dedicated potters and now runs professional courses. Turning Earth is another important initiative. The growth of interest is part of the desire for meaningful occupation, outlets for creativity and products that are personal and have human marks. It’s all good news for potters. Previous Post HOW MUCH TIME SHOULD YOU SPEND IN THE STUDIO?